​Recently, after completing an intensive course, I finally had the opportunity to watch Bong Joon-ho’s new film, Okja, which has been receiving a lot of attention in the vegan and nonhuman animal rights activist communities. Aside from applauding it for being a beautiful film that will hopefully inspire many viewers to consider the subjectivity of nonhuman animals reduced to commodities within the agricultural industrial complex, I would like to focus on the interesting opportunities that it presents to elucidate the intersections between species politics, colonialism, food justice, and gender for a wide audience. I will also comment more broadly on aspects of the film that I found to be progressive and those that I wish had been done differently. ​Apart from the ethics of consuming nonhuman animals (who I will refer to as “animals” henceforth for the sake of brevity), a clear overarching theme of the film is food imperialism. Very early in the film, Lucy Mirando (played by Tilda Swinton), the CEO of its main corporate villain, states that her company kidnapped and exploited a creature indigenous to Chile in order to create Okja and her siblings (who look roughly like hybrids between pot-bellied pigs, hippos, and elephants). The “Super Pig Competition,” which the film’s introductory sequence tells us involved exporting twenty-six “super piglets” to small subsistence farmers, mostly located in non-Western countries and in the Global South, is clearly a Disneyfied colonial project made for reality TV. ​I think that Bong made a refreshing and responsible choice by making the main villains corporate executives instead of slaughterhouse/CAFO workers, as I’m frustrated by the tendency of vegans and animal activists to villainize the latter group. (For context, slaughterhouse/CAFO jobs are perhaps the most degrading, dangerous, and physically and psychologically debilitating jobs in the entire agricultural industrial complex, and they are overwhelmingly performed by people of colour and undocumented immigrants with few other choices in North America.) However, that being said, I really disliked the particularly awful scene depicting Dr. Johnny drunkenly torturing Okja in Mirando’s seedy underground nightmare lab. I can’t help but feel that it reinforces the “animal-abusers-are-monsters” narrative: of course, as we should know, the worst injustices are committed by mentally “normal” people simply complying with what violent institutions expect of them, not by people who defy psychological and social norms (such portrayals, moreover, are frequently ableist, and I dislike how Dr. Johnny’s heavily implied depression is depicted as contributing to his cruel actions). With its close proximity to the sequence heavily implying that Okja is being sexually abused in the lab, that scene was very uncomfortable to watch and made me feel gross. In contrast, I enjoyed the depiction of animal activists as heroic, which is a departure from the usual framing of animal activists as either terrorists or punchlines in capitalist popular media, but I found some of the stereotypes ostensibly played for comic relief (such as a hungry activist refusing to eat a tomato because of its carbon footprint) to be a bit cringeworthy. However, I loved seeing the activists in action, and one of my favourite moments was the chase scene in the Seoul shopping mall, during which the activists use umbrellas to deflect the military police officers’ tranquilizer darts. The entire sequence made me feel elated, and I thought that the latter detail, in particular, was quite clever. ​Regarding the ending, I was relieved to see Okja safe after the horribly brutal third act; however, I wish that the film had instead ended with a rescue story that challenged capitalism. (To be fair, given the dire circumstances and the age of the protagonist, it made the most sense to have her try to buy Okja from Mirando.) 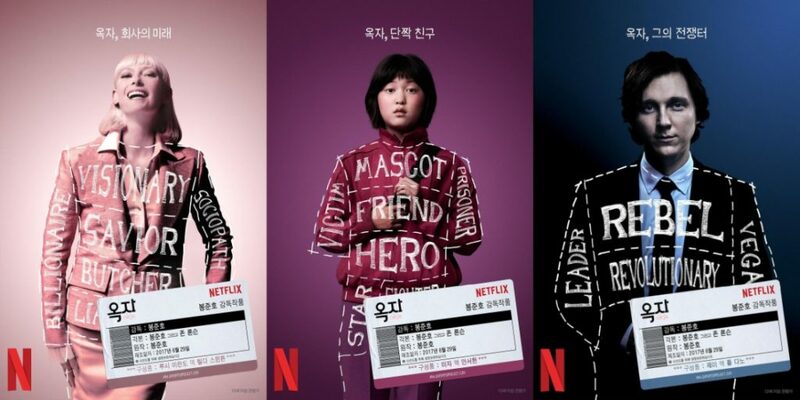 I also think that there is something interesting with regard to gender and species politics going on when Mija (played by Ahn Seo-hyun) saves Okja’s life, since the gold pig that she bribes Nancy Mirando (also played by Tilda Swinton) with—a blatant symbol, like the piggy bank and the bronze Wall Street bull, of the association between farmed animals and capital—was supposed to be a wedding gift. Additionally, earlier in the film, Mija’s grandfather (played by Byun Hee-bong) gives her a speech effectively telling her to “grow up,” reflecting the attitude that viewing animals as commodities rather than siblings or friends is necessary in order to become an “adult,” after giving her the gold pig, which represents growth into healthy heterosexuality and gender norms. It’s telling that she angrily rejects the pig until she realizes that she can bribe someone with it. ​I also find Okja refreshing in its refusal to portray “humane meat” as a solution to the problem of industrial animal agriculture, which is overwhelmingly the case in the few capitalist popular media creations that deal with the ethics of eating animals (two particularly bad offenders in this category being the documentary Food, Inc. and Temple Grandin, the HBO adaptation of the American slaughterhouse designer’s autobiography). Although Okja doesn’t portray veganism as imperative, either (as many other reviewers have pointed out, Mija and her grandfather are shown eating fish and chickens on their idyllic farm without a hint of criticism), I would argue that the film subtly mocks and deconstructs the idea that the developed Western world’s ever-increasing appetite for animal products can be indulged in a “humane” way. As Lucy Mirando makes clear early in the film, the primary purpose of the Super Pig Competition and Dr. Johnny’s involvement in the project is to reassure consumers that the corporation is working with “local farmers” and expert veterinarians to raise animals in ideal conditions, far from Mirando’s sordid history of chemical weapons factories and industrial slaughterhouses (one of which is depicted with disturbing realism in the third act). Like Okja herself, Mija is literally paraded around on display and exploited as a sideshow-style attraction in New York City, with the justification that the presence of an “authentic” exotic racial Other will lend legitimacy to Mirando’s claims of sustainability and humaneness. As numerous investigations into the supposedly “unbeatable” standards of the suppliers of companies like Whole Foods have shown, “humane” and “sustainable” labels on animal products rest on top of a mountain of “little white lies,” like Lucy says. Instead of soothing and neutralizing viewers’ discomfort with the inherently violent and reifying process of rendering individual animals into “meat,” Okja emphasizes above all the subjectivity of farmed animals, even if they’re represented via a computer-generated monster pig.